It may be a week before Thanksgiving, but it’s never too early to decorate for Christmas. I lit a fire in the fire place, cranked up the Christmas music, baked a home-made molten chocolate cake, and tackled those decorations. 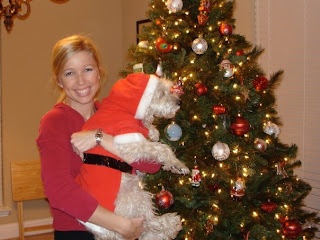 We found Harley the Wonder Schnoodle’s Santa costume when we were unpacking decorations. He absolutely hates this outfit… I suspect because it’s made from cheap polyester, which probably doesn’t feel good on his skin. But when I put it on him, he cowers, sulks, pouts, and gives me mean, hateful looks until I take it off of him. I should probably be more sympathetic, but it’s hilarious to watch, so we pulled out the camera to document his disgust. I don’t know if you can tell from his body language, but my roommate was trying to get him to look at her while she took the photo, and he stubbornly refused. This is Harley’s “I hate you both” look. Isn’t it adorable?